It has been said on more than one occasion that I am somewhat of a brunch addict. I have often indulged in two per weekend, some of which have been known to last for 5-12 hours depending on the orange juice to champagne ratio. Some may say this is excessive, but personally I feel like it is my right as a Brightonian to indulge in the perfect meal that allows for me to have a luxurious lay-in and a hollandaise covered breakfast; often with cocktail in hand….is that so wrong?! I think not! 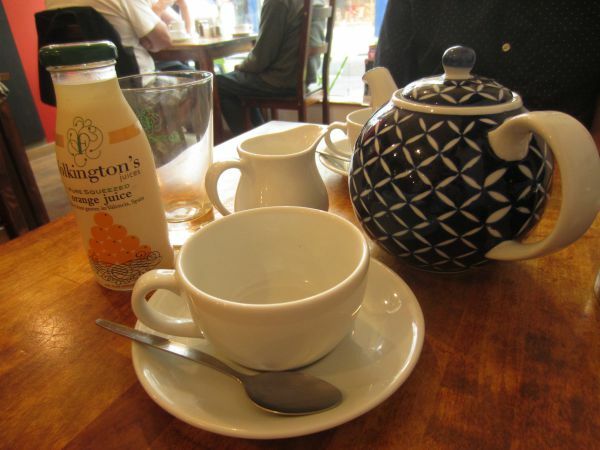 So it is no surprise that on a drizzly Sunday morning, usually reserved for duvets and Netflix, my husband and I decided to brave the elements and head to Kemp town’s Morris and Jacques to indulge in one of my favourite pastimes…Brunch. 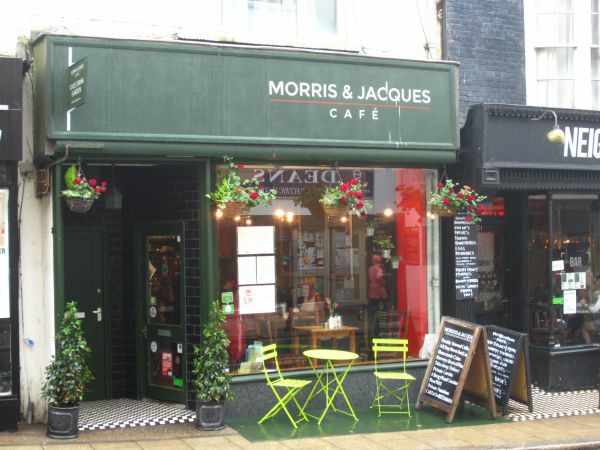 When we arrived at Morris and Jacques we were greeted by jovial staff that were clearly busy in this cheerful little cafe, but had everything well under control. Every table was full but it didn’t feel crowded, and the waitstaff had service well in hand; easily serving all of the tables calmly and confidently which allowed all the diners to relax. As it was grey and drizzly we sat in the cozy front room overlooking St James Street. There are about 8-10 tables inside and though the restaurant is a few years old now, it looks as clean and fresh as a new. 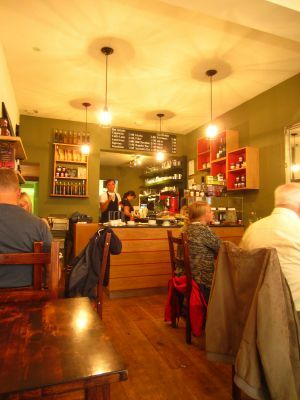 The main decor of the cafe are shelves filled with local homemade Sussex jams, Nutbourne chutneys, Hartington honey, and Sussex Gold olive oils which gave the whole room a relaxed and hometown feel. Personally I love that they chose to showcase local artisans instead of expensive high street brands, what a classy touch. So many restaurants in Brighton claim to use Sussex products, but when it comes down to it end up at Asda. I was really pleased to see that M & J were really walking the walk as they say, sticking to their ethos that local businesses are worth supporting and can create a darn fine product, very impressive. We were seated by the the large front window that let in tonnes of light and is the perfect place for the my favourite Kemp town pastime; people watching. It’s a shame the weather was against us as I would have loved to sit in their beautiful sun-trap garden, but this now gives me even more reason to return, because even through the rain you could tell that it would be a brilliant place to brunch with friends. 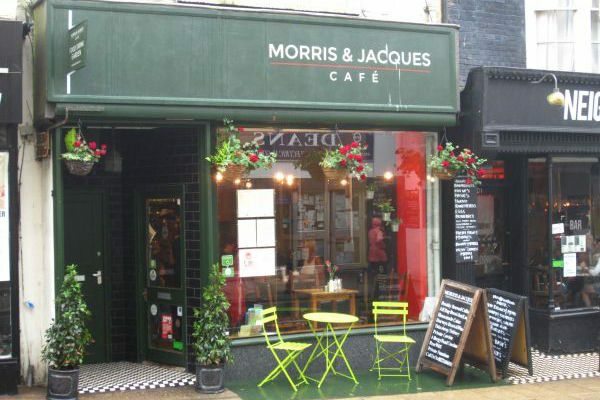 Morris and Jacques is open for Breakfast, Brunch, and Lunch and their menu is varied, accessible, and filled with old favourites done really well. Fresh is the word of the day at M & J, everything they serve is locally sourced and as fresh as they can get. Their bread is from Real Patisserie baked daily only a mile away, most of their veg is from the corner green grocer and grown right here in Sussex, and the meat is top quality and sourced from Brighton’s own J & J butcher. Not only that, but the eggs are farm fresh too, and you can tell just how fresh when you break into a perfectly poached egg and see the bright iridescent orange colour of the yolk, delish! My hubby ordered M&J’s breakfast with poached eggs, and from the menu it sounded like a standard fry up, but I can tell you this was not your normal greasy spoon. 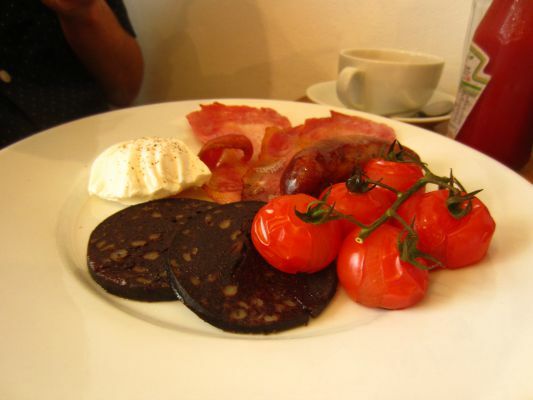 The dish was served with two rashers of crispy smoked side bacon that’s saltiness was balanced by a thick slice of earthy black pudding, and they were joined by two butchers choice sausages that were sweet and juicy and everything you want from butcher quality meat. Each of the ingredients were clearly quality and served piping hot, accompanied by vine ripened cherry tomatoes that were slow roasted to perfection. They were so sweet and tender the skin just fell away, and they were the ideal complement to the salty savouries on the plate. The poached egg was firm and gooey adding a creaminess that smoothed out the dish and received top marks from my ravenous partner. 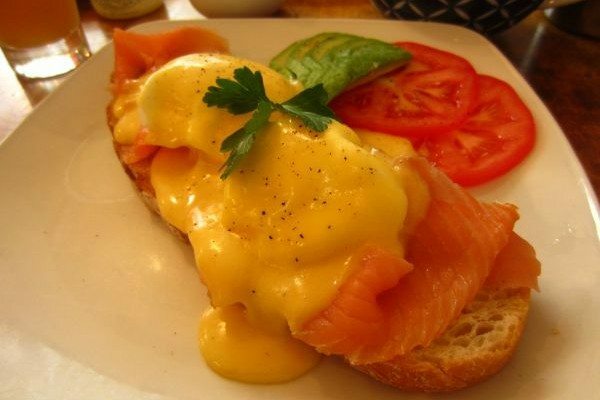 As always I ordered the Eggs Royale, it my Achilles heel, if it’s on the menu I have to have it. I was so impressed with the fresh ingredients I asked to add slices of fresh beef steak tomato and avocado, this is what I like to call a ‘California Style Benedict’, and they were more than happy to oblige. The Benny was served on a thick slice of my favourtie bread ‘Chewy Brown’ which is soft in the middle and crunchy on the crust, and was layered with a healthy portion of smoked salmon, topped with two perfectly poached eggs, and generously covered with homemade hollandaise, which I actually watched them whisk up to order! The tomatoes were so fresh you could smell the sunshine in them, and the avocados were perfectly ripe and added an extra creaminess to an already decadent dish. Every single bite was delicious, and I think I have found my new favourite benedict in Brighton, well done M & J, well done! After brunch we finished our Metro-Deco tea (also local) and had a chat with the friendly staff who got me really excited about some of the fun things they will be up to in the next little while. 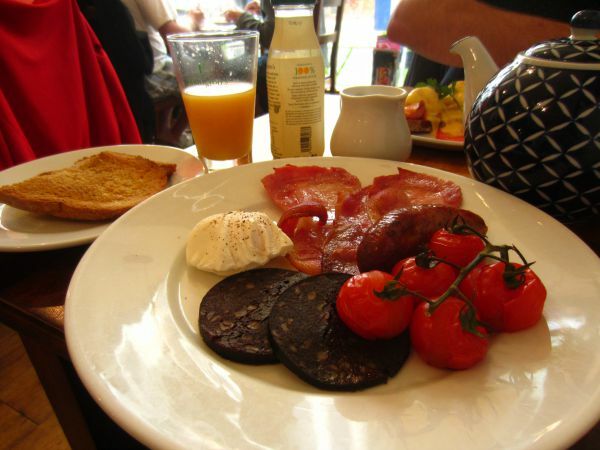 As they are located on St James street, and there is this tiny little festival called Pride on its way, they decided to embrace the hungover masses and are offering up a pre-Pride breaky, brunch and bbq. They will be serving their amazing food along with champagne, bucks fizz, and bloody mary’s in their sun-trap garden which will be the perfect oasis for a slow start to a full day of festivities. M&J also put on wine tasting evenings and the occasional pop-up for dinner, the next one is a Spanish tapas and Paella night that sounds divine, so I will definitely be keep my ear to the ground for more special evening delights. 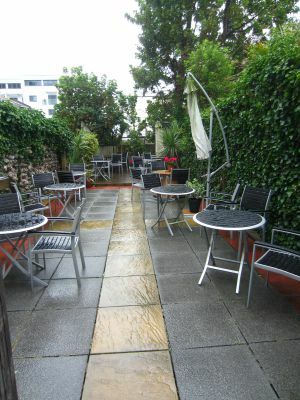 Even though the weather was against us, M & J really made the trek to Kemp town totally worth it. I love that this place had nothing to hide, and why should it, everything they are doing is brilliant! Cracking farm fresh eggs and whisking my hollandaise by hand, slow roasting the cherry tomatoes on the vine to turn them into sweet and salty flavour pockets, and using real butter to coat the whole grain toast…it’s just how it should be done full stop. 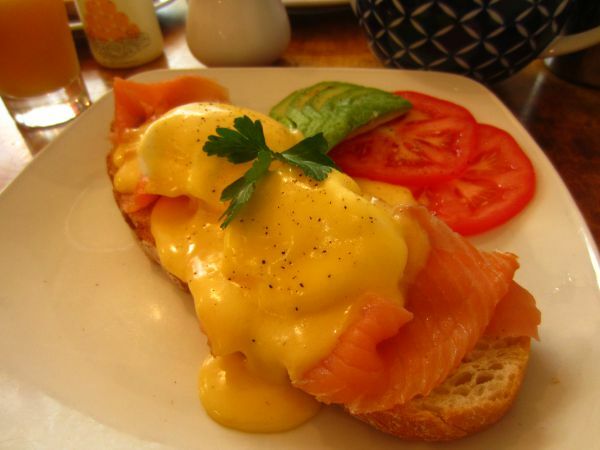 On the next sunny day you will most definitely find me taking in the sunshine while indulging in yet another ‘California style’ eggs royale brunch at M&J and I can’t wait!